You have probably been able to get dressed all by yourself since you were about 6 years old. Maybe back then you had a little trouble with the shoe laces but, other than that, getting dressed has pretty much been a solo act for the remainder of your life… then comes your wedding day. Not so long ago, brides, grooms and the wedding party ( including parents) got dressed at their individual homes, with the photographer snapping pictures throughout the process to show the transformation for regular citizen to bride (or groom). I’m sure this still takes place. However,one of the best decisions you can make is arrangements to prepare for your wedding on site. Why? I’m glad you asked! #1) Weather. Weather can be your worst nightmare for three reasons: Cold, rain and humidity. In cold temperatures, you will have to purchase something fashionable and attractive to go over the gown so you don’t freeze to death on the way there. Rain will mess up not only your gown but, also your hair, makeup and any chance you have for looking your best. Remember last weekend when buckets of rain were pouring down from the sky? Humidity can frizz or flatten, expand or squash … almost every hair type falls prey to humidity. It will also cause your gown to wrinkle easily since there is more moisture in the air. #2) Wrinkles. Speaking of wrinkles, the men will get wrinkled pants from sitting, the bridesmaids gowns will most likely need to be re-steamed and any silk bridal gown will be a wrinkled mess after traveling even a short distance after being seated in a vehicle… even for a short time. #3) Time– Getting ready at home provides you with a false sense of time; you are never in a hurry until you realize you are late. Getting ready at the church or ceremony site will keep you mindful that the clock is ticking. Instead of worrying about these inconveniences, plan on getting dressed at the place where the ceremony will occur. -Make arrangements in advance for a dressing area that is spacious and have refreshments on hand. -Have your hair and makeup done prior to getting dressed. – Allow extra time for conditions like humidity which may require additional products for your hair and makeup. 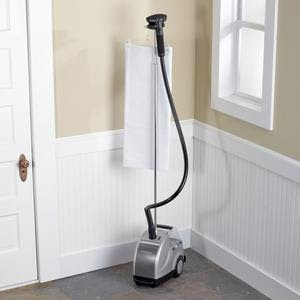 -Rent, borrow or buy a steamer to do touch ups on gowns and tuxedos. An iron will work on some fabrics but gowns with pickup skirts and layers of tulle will need to be steamed. – Hire or appoint someone as your dresser. If your bridal salon offers this service, it is well worth it. 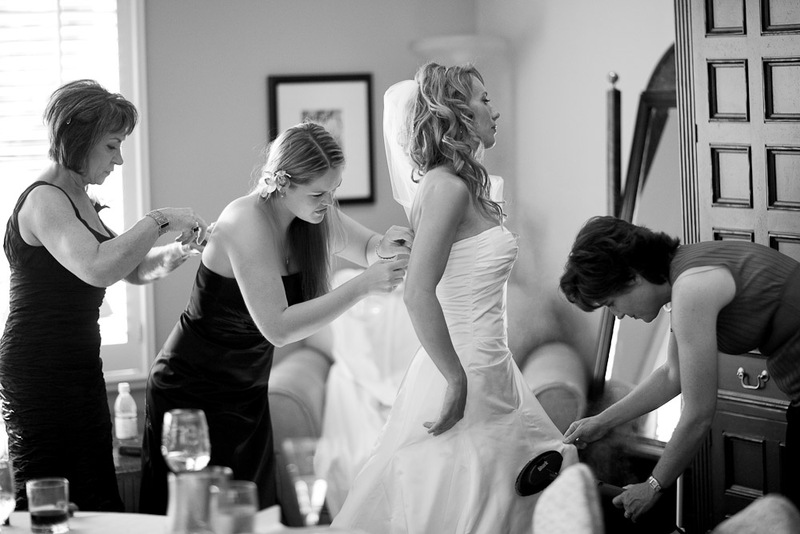 They can steam, button, zip, fluff, adjust and inspect the bridal party so that everyone walks down the aisle perfectly coiffed and put together. You will never regret the decision to get dressed at the site where things will take place. You will have more room, less distractions, and an added bonus is that the photographer can capture images of both male and female members preparing for the wedding simultaneously.